We've had a couple of days in which we could legitimately turn our focus away from the world and its events in order to concentrate on our faith and families. But it is a testament to the times in which we live that less than 24 hours after Christmas Day, the leader of ISIS declares that the Holy Land of Israel will become a graveyard to the Jews. 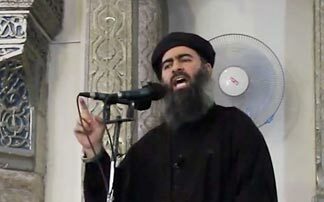 In a video released on Saturday, Abu Bakr al-Baghdadi directly threatened the nation of Israel and the city of Jerusalem, saying, "The Jews thought we forgot Palestine and that they had distracted us from it ... Not at all, Jews. We did not forget Palestine for a moment. With the help of Allah, we will not forget it … The pioneers of the jihadist fighters will surround you on a day that you think is distant and we know is close. We are getting closer every day." His message is in response to increased opposition from the US-backed alliance of Syrian Kurds and Arab rebel groups, and other coalition forces. Russia has also stepped up its bombing of ISIS infrastructure and positions from its Khmeimim airbase in Latakia since late Fall, at the request of the Syrian authorities. Yet it is difficult for us here in the US and the West to understand the complexities of this battle in the Middle East against Evil. An article on The Guardian website puts it all in perspective: "The fundamental issue is that ISIS is an enemy of the enemies of many Arabs – Iran and Assad, whom Tehran has backed to the hilt since the Syrian crisis began in 2011. So far the Saudis still fear Iran in the long term more than they fear Daesh (the Arab term for ISIS)... Everyone says they are against ISIS, but it is no one’s top priority. It is not yet the organizing principle of politics in this region." And so, al-Baghdadi, the leader of ISIS, feels safe in boasting "that God will grant victory to those who worship him, and hear the good news that our state is doing well. The more intense the war against it, the purer it becomes and the tougher it gets." He also feels confident in calling on Saudi citizens - the second biggest contributor to ISIS ranks - to "rise up" against their government as he dimissed the kingdom's newly formed Muslim coalition against the caliphate. "If the Islamic coalition against ISIS were truly Islamic, it would declare that it was cutting ties with its Jewish and crusader masters and that its goal was to kill the Jews and liberate Palestine," he said on the released tape. To be honest with you, it is difficult for me to understand -- or even to believe -- what we are told through various sources. Who is on which side? Are the coalition forces really working together, or are they each trying to benefit their own political agendas? How do the various factions of the Islamic faith play out in relationship to ISIS and their goals? Is any nation in the Middle East really concerned about stopping ISIS's aggression against the West? I think we all have these questions, and more, and nothing seems to be getting solved; ISIS seems to be getting more aggressive and the involvement of nations like Russia, Syria, Iran, and Turkey have clear Biblical implications -- for those of us to whom that matters. Therefore, this latest diatribe against Israel and recent warnings from a branch of ISIS in Damascus, Syria that "We will enter Al-Aqsa mosque as conquerors and our car bombs will strike the ramparts of the Jews." has me seriously considering the Bible's prophecy in Zechariah 14, that "I (God) will gather all the nations against Jerusalem to battle, and the city shall be taken and the houses plundered and the women raped." (This certainly fits the mode of operation employed by ISIS). You see, it is not just ISIS, or Iran, or Hezbollah, or Hamas, who think that Israel unjustly occupies the Land. Throughout the Bible, nations have sought to remove Israel and the tribe of Judah from the land appointed to them by YHWH. And the final book of the Bible, Revelation, tells us that Jesus (Yeshua), the Messiah, is returning to save Israel from the final nations and armies of this world who will, once again, accuse her of stealing the Land. But, according to the Bible, the "right side" to be on is "Israel's side" in this coming battle. Because Yeshua is returning to not only judge the world, but to judge Israel, as well -- just as God has judged and disciplined them throughout their history. But we must never forget that the remnant of Israel is much beloved by God and it is Jesus who will save the children of Israel and destroy her enemies. From my limited perspective, it certainly looks as if events are pointing towards Israel standing alone. And that fits what the Bible has forecast, too. So, as we watch the world rushing towards the fulfilling of the Bible's prophecies, we can almost see it unfolding before our eyes. There are the rumors that Israel is seeking new relations with Turkey and to restore diplomatic ties. I have even read articles from the UK that purport some kind of secret "peace deal" between Israel and Hamas, brokered by former Prime Minister Tony Blair. All of it hints at Daniel's prophecy of a seven-year peace treaty during which time the Anti-Christ will be revealed. None of us, and least of all me, can predict when and if we are on the precipice of fulfillment of these prophecies. But our discernment is telling us that the time is near; that we need to be right with God, and we need to pray for Israel. For just like we Christians, Her only hope is in God, Jesus (Yeshua), the Messiah. Evil is marching towards Her and the Day of the Lord is at hand. Isaiah 34:16 "Seek out of the book of the Lord and read: not one of these [details of prophecy] shall fail, none shall want and lack her mate [in fulfillment]. For the mouth [of the Lord] has commanded, and His Spirit has gathered them." The leader of ISIS declares that the Holy Land of Israel will be a graveyard of Jews. The Bible says in Psalm 83 and Ezekiel 38-39 that the Holy Land of Israel and the surrounding area will be a graveyard of Muslims and many nations with them, and God will show them who the real Messiah is in this world. Yes! Which just goes to show how deceived they are in listening to their god, who would have them believe his lies. Satan seeks to counterfeit God's Truth, but distorts it by confusing the masses.